The word mausoleum is nowadays defined as “a special building made to hold the dead body of an important person or the deceased bodies of a family”. This word is derived from the name Mausolus, for whom the original ‘Mausoleum’ was built. Located in modern day Bodrum, Turkey, the Mausoleum of Halicarnassus is one of the ‘Seven Wonders of the Ancient World’. Due to this status, the Mausoleum is one of the most well-known structures in the ancient world. After the Great Pyramid of Giza, this is the longest surviving Wonder, having stood for more than a millennium and a half. The Mausoleum of Halicarnassus was built for Mausolus, the second ruler of Caria from the Hecatomnid dynasty (and nominally a Persian satrap) who died in 353 BC. As the man who refounded Halicarnassus, Mausolus was entitled to receive cultic honours and a tomb on the central square of his city, in accordance with Greek custom. The person in charge of this project was Mausolus’ grieving widow, Artemisia II, who, incidentally, was also his sister. 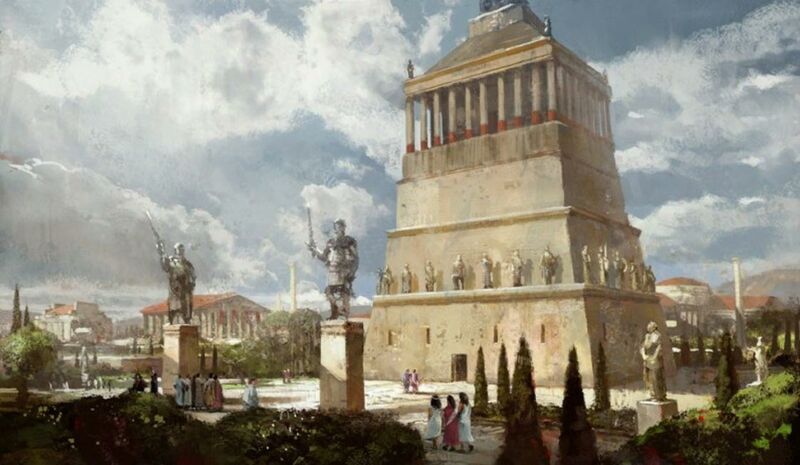 Who Designed the Mausoleum of Halicarnassus? The design of the Mausoleum is said to have taken its inspiration from the early 4th century BC Nereid Monument of Lycian Xanthos, albeit on a much grander scale. The Greek architects Satyros and Pytheos were said to have been invited by Artemisia from Greece to design the overall shape of the Mausoleum, whilst the sculptors Byraxis, Leocharis, Timotheus, and Scopas of Paros were in charge of the decorations of the monument. Working under them were hundreds of other workmen and craftsmen. The end result was a wonder built in the styles of three different cultures – Greek, Lycian and Egyptian. Perhaps for maximum visibility, the Mausoleum was built on top of a hill overlooking the city. A stone platform was first built, and was enclosed with a courtyard. The top of this platform was reached by a flight of stairs flanked by stone lions. Along the outer walls of the courtyard were statues of various gods and goddesses, whilst mounted stone warriors were stationed at each corner. At the center of the platform was the Mausoleum itself. Whilst the building was constructed of bricks, it was covered with white Proconnesian marble, giving it a splendid look. The first 1/3 of the Mausoleum was a square, tapering block covered with relief sculptures. These reliefs included standard images from the Greek repertoire, including the Centauromachy (the battle between the Lapiths and centaurs) and the Amazonomachy (the battle between the Greeks and Amazons). The next 1/3 of the monument consisted of a set of 36 Ionic columns. Between each column was a statue, and a solid block was constructed behind the columns to bear the bear the weight of the structure’s roof. This roof, which covered the final 1/3 of the building, was a step pyramid with 24 levels, topped with a sculpture of Mausolus and Artemisia riding a four-horsed chariot. Whilst the conquest of Alexander the Great several decades later brought the Hecatomnid dynasty to an end, the Mausoleum outlived the dynasty for over a millennium. During the 13th century, a series of earthquakes destroyed the columns, and brought the stone chariot crashing to the ground. By the early 15th century, only the base of the structure was recognizable. By the end of the same century, and again in 1522, following rumors of a Turkish invasion, the Knights of St. John used the stones from the Mausoleum to fortify the walls of their castle in Bodrum. Additionally, much of the remaining sculptures were ground into lime for plaster, though some of the best works were salvaged and mounted in Bodrum castle . Several of these statues were later acquired by the British ambassador for the British Museum . The location of the Mausoleum was subsequently lost, and was only rediscovered during the 19th century by Charles Thomas Newton, who was working for the British Museum. Newton was successful in his quest, and managed to locate some walls, a staircase, and three of the corners of the foundation. In addition, Newton also discovered sections of reliefs that decorated the wall of the building, portions of the stepped roof, a broken chariot wheel from the sculpture on the roof, and two statues believed to have been in that chariot. These objects were then taken to London, where they are still on display in the British Museum, though the Turkish authorities are seeking to have them repatriated . They are the last remnants of a once spectacular monument that had the ancient world in awe. In 2017, it was announced that the Mausoleum of Halicarnassus will be revived by The Danish Halikarnassos Project. While no dates have been provided yet for the restoration of the Mausoleum, when the ancient structure is restored it means there will be at least two of the ancient wonders of the world available for modern eyes to gaze upon once again. Meanwhile, the Culture and Tourism Ministry of Turkey has also set plans in motion to create an open air museum at the site.